Biography As It Ought To Be. Would you listen to Rebel Yell again? Why? Yes, I found it vastly entertaining and informative; with the passage of time, I can seem myself re-reading, or re-listening to the book. Stonewall Jackson. He is the subject of the book. The writing and presentation are of such a nature, you feel like you have actually met this very complex and accomplished individual. 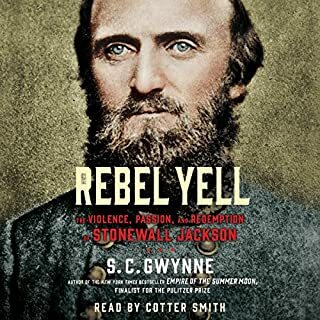 The force of Jackson's character- as presented in this book- is so strong that I felt compelled to visit the Stonewall Jackson House in Lexington, VA. I am glad I did. My familiarity with Jackson, made possible by this excellent work, and combined with the excellent work done by those preserving the home, made it seem that he was still living there. What about Cotter Smith’s performance did you like? Spectacular! It seemed that he was telling a story from personal experience, rather than from the pages of a book. By far, the best performance I have heard. The prologue, following Jackson's death. It is hard to imagine a better summation. The quality of the work- both author and narrator- is such that it transcends the civil war. It is, of course, the story of the man and his times; but it presents the man in such a way that you feel he could be walking among us today. 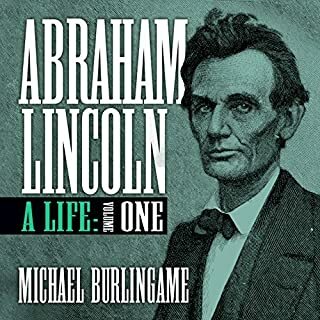 In the first multivolume biography of Abraham Lincoln to be published in decades, Lincoln scholar Michael Burlingame offers a fresh look at the life of one of America's greatest presidents. Incorporating the field notes of earlier biographers along with decades of research in multiple manuscript archives and long-neglected newspapers, this remarkable work will both alter and reinforce our current understanding of America's 16th president. I would recommend this book to a person interested in Lincoln, it does include considerable amount of historical information about the early life of Abraham Lincoln not included in Sanburg's volumes. Having said that, I would also warn that, in the book, following presentation of a group of facts/events/quotes, the author does have this tendency to follow-up with psycho-analysis........as if he had recently had the great president on the couch. I cannot be certain if this annoying aspect of the book seems as pervasive if one reads the print edition; but narration by Mr. Pratt gives it a force I find difficult to ignore. My favorite example is the presentation of the death of Abe's biological mother as the root cause of Abe's distrust of, and difficulty with, women. You see, his mother died on him, so women could not be trusted. This fact, then followed-up with an account of how Abe felt deep resentment for Grigsbys, as he blamed them for the early death of his sister, Sarah........Should not Abe have seen Sarah's departure as just another example of the unreliable nature of women? It is as if the Author is not satisfied with the fact that the entire volume is his creation, he has to insert himself into the volume. I wish he had not done it. The quality of historical facts, events, and quotes speak well for themselves. The book does seem well researched, and does include considerable information from Abe's early years. However, I found the author's tendency to pluck the subject from an environment that could be considered typical for many from his, Abe's, time and offer a conclusion as to future psychological development, made this seem like more of a psychology thesis than unbiased text about a past president . The inflection and tone of the narrators voice add to this impression. the volume of information presented. Would you be willing to try another one of Sean Pratt’s performances? Honestly, if I were looking at several audio-books covering the same person/event of history, and I saw Mr. Pratt's name as the narrator for one of them, it would influence me to pick another. Technically, Mr. Pratt is good. It is easy to follow his narration. My judgement is based entirely on personal feeling concerning quality of voice and style of presentation. If you have listened to Carl Sandburg's Abraham Lincoln: The Prairie Years and The War Years, and liked the Arthur Morey narration, you will find this vastly, maybe distractingly, different. Do you think Abraham Lincoln: A Life, Volume One needs a follow-up book? Why or why not? There is a follow-up book. I may purchase it, but do not feel a strong compulsion to do so. The ImmersionPlus series of original vignettes has been created especially for the intermediate to advanced foreign language students who want to improve their foreign language comprehension. 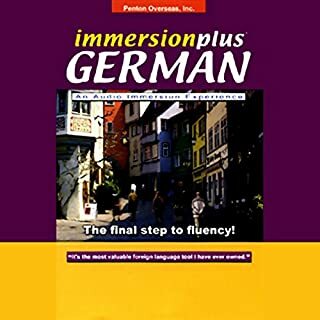 The audio and idea are great, and it does benefit the individual trying to progress from intermediate to advanced ability in German language comprehension. I note that the standard,i.e. complete version available from the publisher, includes a printed German to English translation. Such a translation would be helpful here and should be provided in either text or spoken format with the download. If you are serious about improving in German language comprehension, consider the version available from the publisher.